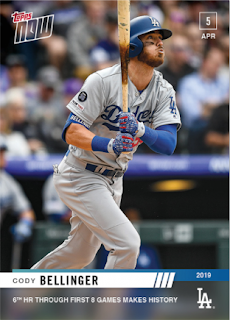 Blog Kiosk: 4/8/2019 - Dodgers Links - Santa Maria! 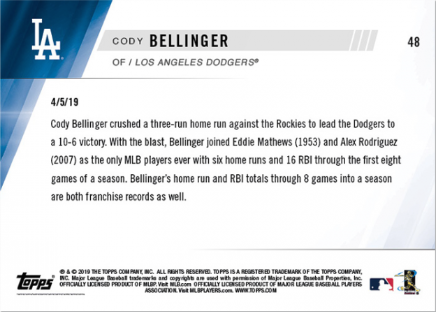 This Day in Dodgers History: In 1968 Opening Day is postponed throughout Major League Baseball due the funeral of Reverend Dr. Martin Luther King, Jr. who was assassinated on April 4, 1968. In 1974 Dodger hurler Al Downing gave up a fourth inning home run to Hank Aaron -- surpassing Babe Ruth's record with his 715th homer of his career. You can watch the homer here, as called by Vin Scully. In 1987 GM Al Campanis is fired by the Dodgers following his racially insensitive remarks said on an April 6th telecast of ABC-TV's Nightline. Campanis had said that blacks may lack some of the 'necessities' to be a field manager or general manager. In 1994 Braves lefty Kent Mercker no-hit the Dodgers, 6-0. This game also marked Chan Ho Park's first career start as a Dodgers and the very first game played by a Korean ballplayer in the Major Leagues. Check out the boxscore here. Happy Birthday, Lady Baldwin, Pete Cassidy, Kirby Higbe, Turk Farrell & Gary Carter!